Happy friday!! Ahhh, the weekend is here, which is always too short :) We went to the wedding of my brother in law today and had a lot of fun, that's why I am so late with my card for today. Einen schönen Freitag wünsche ich euch. Ahhh, das Wochenende, lang ersehnt und immer viel zu kurz ;) Wir waren heute auf der Hochzeit meines Schwagers und hatten viel Spaß. Deswegen bin ich auch so spät dran mit meinem Post von heute. 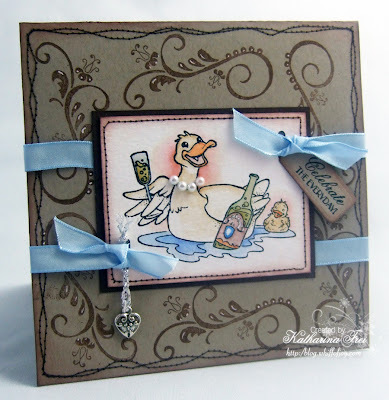 Daisy, the celebrating duck from Whiff of Joy Stamps. I wanted to do an elegant card with her to show that even those very cute images can have an elegant touch ;) I stamped the background with the Inques Boutique set "French Quarter" with chocolate chip ink from Stampin' Up on kraft cardstock and added some details with a white gel pen. Daisy, die Partyente von Whiff of Joy Stamps. Ich wollte eine recht elegante Karte mit dem Motiv machen um zu zeigen, dass auch diese sehr lustigen Motive einen eleganten touch haben können :) Ich habe den Hintergrund mit dem Inque Boutique set "French Quarter" mit Chocolate Chip ink auf kraft cardstock von Stampin' Up gestempelt und ein paar Highlights mit weissen Gelstift gesetzt. I added crystal effects to the glas and the bottle to simulate glas. There are some tiny halfpearls around her neck. All borders are distressed with a brown inkpad. The sentiment is from the Whiff of Joy general sayings collection. Das Glas und die Flasche habe ich mit crystal effects bestrichen um einen Glaseffekt zu erzielen. Um ihren Hals sind ein paar kleine Halsperlen angeordnet. Der text ist von dem Whiff of Joy Gebräuchliche Texte Set. 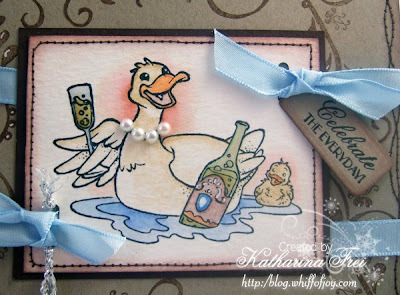 Fabulous card Katharina, love this duck and your great idea to give her a necklace, very elegant! Love the sentiment stamp too! Looking forward to seeing the sneak peeks of Elisabeth's new designs! Ooooo more stamps...I am so excited!!!! Now I can't wait for Sunday! Yahoo! Beautiful card too Katharina! It's so gorgeous! Eine tolle Karte Katharina... wow. Stunning and elegant Katharina. Those pearls really do make Daisy look like a real lady. Love the crystal effects too. Gorgeous card. I think you have done an excellent job in making a cute stamp look very elegant. love the pearls round her neck adds a great touch. Your card is very delicate, compliments!!! That is very clever Katharina. Love the duck with the necklace. gorgoeus hun, love the pearls around Daisy's neck a very posh duck! This is so beautiful! I love the pearl necklace! I can't wait to see the kit!! Ach schon wieder neue Stempelchen,na bin ich ja schon sehr gespannt. *hibbel*Die Karte sieht wunderschön aus. What a great card, love the necklace of the duck hihi !!! Gorgeous card, love Daisy's pearls. Looking forward to more Elisabeth's stamps. Katharina, du machst mich schon wieder sooooo neugierig. Zum Glück ist nicht mehr lang bis Montag. Die Partymaus habe ich schon zu einer Karte verbastelt. Wenn du Zeit hast kannst du ja mal bei mir gucken. Deine Karte ist wieder ganz bezaubernd geworden. Wahoo is right!! I'm soo excited ...this will be part of my christmas wish list!! Can't wait for a peek!! I got my first WOJ stamps yesterday, are mounting them tonight and then I'm going to make cards! Oh this is just wonderful Katharina, I love her necklace lol. I love the idea of a stamp kit as well - and can't wait for the big reveal!! This is such a sophisticated card. I love all of it together and yes it just shows that even the cute animal stamps can look elegant ! Thanks for sharing Katharina! You are so talented ! Once I have sorted my car this month I am going to treat myself to some of these new stamps! Gorgeous card Katharina - love her posh necklace!!! Oooh you are making my mind boggle with the new stamps - can't wait for the sneak peek!!!! eine wunderschöne Karte, dass Motiv ist ja herzig. Gefällt mir sehr gut. I'm here, waiting for the sneak peek....Oh, I need to get a raise at work...I just got the ones I ordered/won from the Party Tiere release and I'm soooo happy with them!!! So generous of You to give us the chance to win theese darlings. Oh wow,ist die Karte schön! Die Gestalltung,die Farben,na und die Perlenkette,einfach alles wunderschön!